With the comprehensive industry knowledge of allied domain, we are engaged in presenting a superior quality range of HT Cable Jointing Work. We provide a wide array of high-tension work services, which is performed by our capable employees. We provide Maintenance Of HT/LT Cable Jointing. 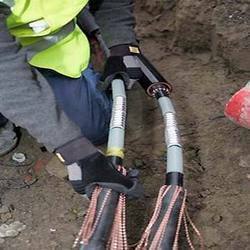 - We also carry out cable jointing and termination work up to 66KV. - We have experience of laying LT and H.T. cables up to 66KV. We offer all types of LT/HT cable joint work (Straight through, I/D, O/D). These cable jointing services, we offer are rendered by our professional engineers and technicians. In these services high tension cables are jointed and laid. All these cables are stringently checked for the faults or defects and sorted out by our professionals.